Colleges and universities before the Second World War sometimes resembled a lodge or fraternal organization more than an institute of higher learning. Ohio State was no different. Campus was obsessed with joining. Fraternities, brotherhoods, clubs, councils, and secret societies were in vogue. Everybody was the vice-president of this, secretary-treasurer of that, or sergeant-at-arms of something else, and a member of as many groups as would have them. One outward expression of this was a year-round whirl of dances, pageants, beauty contests, parades, skits, and all manner of silly stunts and ceremonies sponsored by this or that group. The other was hazing. Groups had members. Members had to be initiated. No one was lower on the collegiate hierarchy than freshmen and they endured most of the hazing. Freshmen suffered through a year of being stigmatized, restricted, commanded, dunked, paddled, and generally abused by upperclassmen. One of the era's traditions was that Freshmen had to wear ludicrous little caps, beanies, when on campus. The caps marked them for harassment and abuse at the hands of upperclassmen. 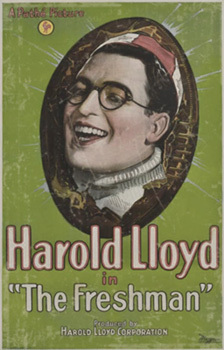 Right: Comic actor Harold Lloyd sports a beanie in poster for The Freshman (1925). At end of the year, the Freshmen burned the hated beanies at a mass gathering and were welcomed into full membership in college society. Tradition also held that Sophomores showed up at the beanie-burning to give the Freshmen one last round of abuse. In the early 1930s at Ohio State, the Sophomores started disrupting the event. They pelted the Freshmen with eggs and garbage. The tauntings became ruder and more personal. They tried to steal the Freshmen's beanies or put out the fire. They dared the Freshmen to physically stop them. This got out of hand. Tempers flared and fights broke out. The event degenerated into a brawl. In 1933, in anticipation of trouble, the whole event was canceled. There was bad blood between the Classes of 35 and 36 that year. They hated each other. The Freshmen chafed after long months of the Sophomores' abuse. As the year ended, the Freshmen retaliated. A Freshman squad abducted the Sophomore class president and threw him into Mirror Lake. Sophomores arranged a retaliatory High Street ambush but the wily Freshmen dodged it. Their honor at stake, the Sophomores demanded satisfaction. An unsanctioned, off-campus egg fight was agreed upon for dusk, Thursday, May 18. Late on the afternoon of the 18th, Freshmen and Sophomores, armed with bags and baskets of eggs and a selection of rotten produce, assembled along High Street. The opposing factions had begun arming well in advance. Supposedly, the Sophomores had laid in a stock of more than 20 bushels of eggs. It had been a warm day, almost 80°F and the boys were ready for some fun. Prohibition was still in force but college boys knew where to get alcohol and the combatants were well lubricated. As the sun sank over the Olentangy, 6-700 Freshmen and Sophomore warriors took their positions as over 2,000 fellow students and some faculty members gathered to watch the fray. The battle was first joined at 11th and High. The rival armies alternated pelting each other with debris and dodging their enemy’s answering fire. 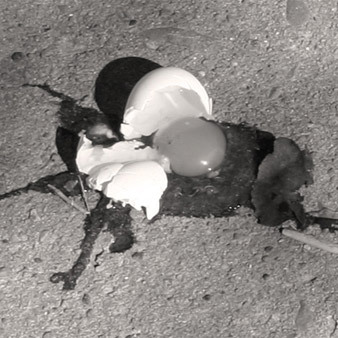 The food fight raged back and forth up and down High Street, as far south as 11th and as far north as 16th, until the sidewalks were slippery with yolks and every surface was plastered with eggshells and smashed fruit. As darkness fell, things started getting out of hand. Some well-liquored and testosterone-poisoned food fighters decided it would be a hoot to target anything that moved. The High Street streetcar was bombarded as it passed between the armies. The conductor and horrified passengers were showered with garbage and eggs. The mob roared its approval. Someone jumped on the slow-moving streetcar and tore off a sign. Again the mob cheered. Since this was s mucho fun, others in the crowd began lobbing missiles at automobiles passing up and down High Street. The crowd started spilling out into the street and High Street was soon blocked. Other rioters began attacking High Street businesses, breaking windows, tearing down signs, and blasting the storefronts from their vast supply of eggs. About 10 PM, management at the State Theater called the cops and four radio cruisers were dispatched to the scene. The students greeted them with a hail of eggs and garbage. From the crowd came cries of "Kill the cops!" The police parked and exited their vehicles which were immediately swarmed by the mob. Car windows were smashed, tires slashed, and spare tires torn off. Finally out of eggs, the mob assaulted the cops with whatever was at hand. Mud balls, turf, stones, bottles, and bricks began flying. The police hunkered down and called for reinforcements. Firetrucks arrived and met the same fate as the police cars. Rioters bombarded them with debris. Daring members of the mob dashed forward to steal things off of the trucks. The delighted on-lookers cheered. Arriving police reinforcements pulled their clubs and started swinging, driving the mob back west of High Street so the firemen could go to work. Under a hail of stones and garbage, the firemen labored to connect hoses and tap a hydrant at 15th and High. With the firehose connected, the tide of battle shifted. The firemen turned the hoses on the crowd. The first ranks were knocked off their feet by the blast. The force of the stream tore the clothes from their bodies. The rest tumbled over each other as they stampeded to get out of the way. Cops rushed in from the flanks, clubs flying, to drive the unruly mob from High Street. That should have been it--but with a crowd of fired-up teenagers, it rarely is. The teens took the firehose and club-swinging police as new elements in the game, new toys to be played with. Time and again the police and firemen drove the students from High Street only to have them regroup and surge forward again. 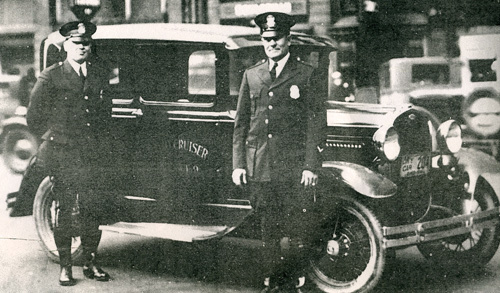 As midnight approached, police and firemen had grown tired of the business. Injuries were mounting and it was just a matter of time until someone was seriously hurt. Some cops had already drawn revolvers but none had been fired. The police called downtown for tear gas bombs and let the students know they would soon be gassed. The teens were delighted with the prospect of a new thrill for the evening's frolic. At the last possible moment, two students stepped forward and negotiated a truce. The cops would not use gas, the firemen would turn off the hoses, and the students would return to their rooms. The police agreed and the wet and weary but jubilant students quit High Street. Cops stayed on the scene until 2 AM but the riot was over. The next morning at dawn, President Rightmire walked High Street to survey the damage. The president promised that students would be held accountable for the damage and that the university would pay for police and firemen’s cleaning bills. Students endured many scolding lectures but, as far as can be determined, no one was ever punished. It would be decades before students will spill into the streets again. When they did it would be in a changed world. College as a playground for rich boys ended with the massive influx of veterans after the Second World War. Men who’d fought at Anzio or stormed Mount Suribachi weren’t much on planning tea dances, voting for May Queen, or wrestling for canes. They for damn sure weren't going to let some 4-F kid tell them what hat to wear or what sidewalk they couldn’t walk on. Through the late 40s and 1950s, most of the pre-war clubs and traditions stagnated, withered, and died or retreated into the narrower world of fraternities and sororities .